Various preventive measures can be implemented to minimize dispersal of the fungus (Wilson 2005). • Avoid injuring healthy trees through pruning and other activities during spring months when potential insect vectors are active, in order to decrease the risk of infection. • Establish a containment zone by cutting down and properly disposing of all infected trees promptly. • Create a buffer zone around infected areas by removing all potential host trees in the buffer, particularly oaks in the red oak group. • Establish trenches to prevent transmission of the disease through root grafts. 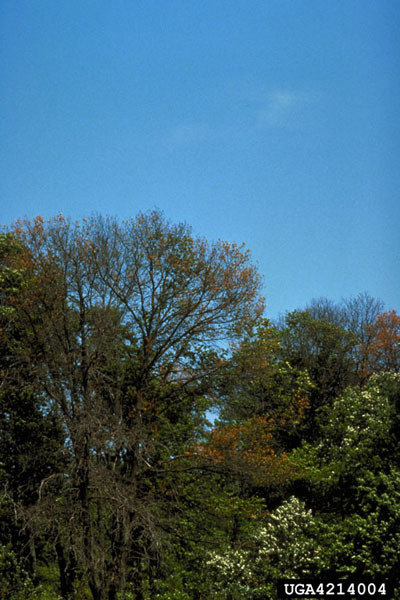 • Inject high-value trees with a systemic fungicide as a preventive measure. Trenches more than 1.2 m deep should be established around infection centres; the trenches should be placed 31 m beyond symptomatic trees. Infected trees within this area should then be removed. This is a primary mechanical approach for limiting the spread of the pathogen. In the past, a fumigant containing metam was used in the USA to kill roots in trenches, but now water permeable membranes are used for this purpose. The fumigant is used in special cases where trenching cannot be done or only partial trenching is feasible. 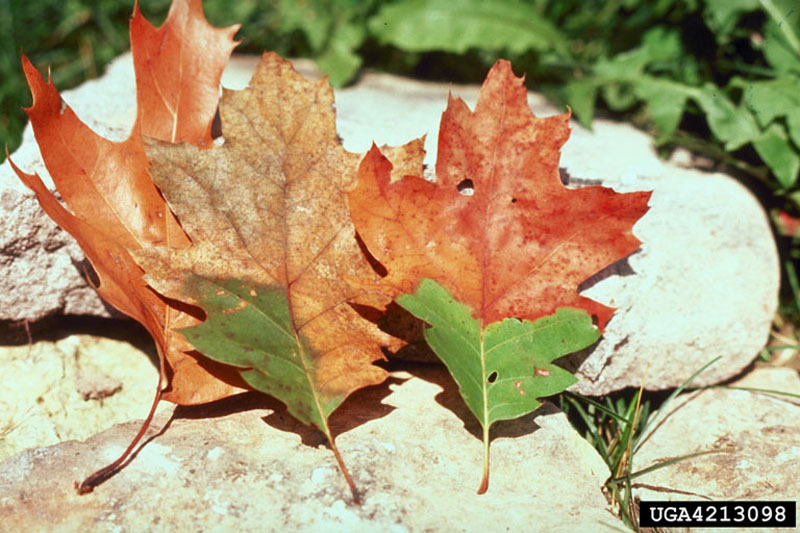 Methyl bromide is the only product (fumigant) registered in Canada for oak wilt control. Biological control tests with Pseudomonas cichorii did not produce conclusive results (Wilson and Lester 1995). No biological control products are available at present. Although trees with oak wilt resistance are not currently available on the market, this represents a potential long-term solution. Early diagnosis and rapid response are essential. Try to prevent new infection centres from developing by removing and disposing of all infected oaks within an existing infection centre. Exercise caution in relation to firewood. Firewood should not be moved between infected and uninfected areas. Do not store infected green wood near healthy oaks; burn infected wood before the spring; cover piles of healthy green wood with clear plastic sheeting, and tuck the edges of the sheeting into the soil. Heat treatment of oak logs from infected zones is essential to prevent the spread of the disease. The logs must be immersed completely in hot water at 49°C or higher for at least 12 hours or in hot water at 43°C or higher for at least 48 hours. Alternatively, the logs can be exposed to hot air at 54°C or higher for at least 24 hours or at 43°C or higher for at least 48 hours (Anonymous 2007). Remove all potential host trees within a 31-m radius around an infection centre, paying special attention to oaks in the red oak group because they produce more fungal spores (Anonymous 2007). Avoid injuring oaks during the period when potential insect vectors are active, that is, from the start of the growing season until July. 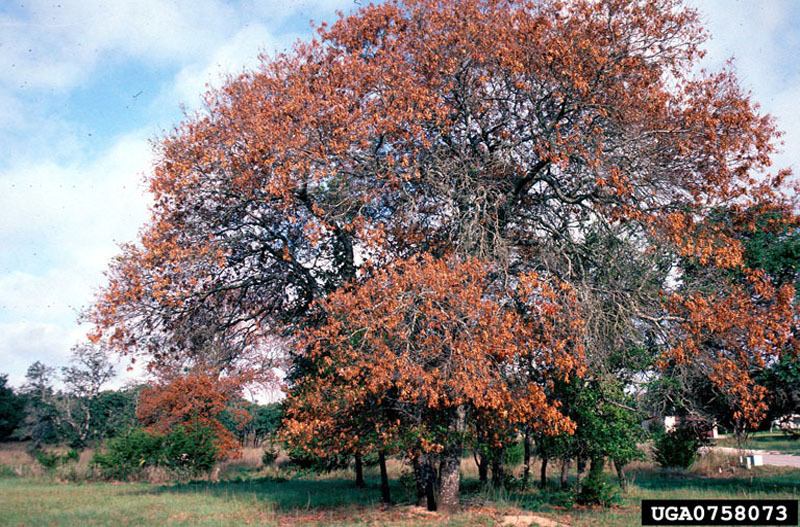 The risk of infection can be reduced by pruning oak trees after July or during the dormant season. Although wound dressings are generally not recommended, treating wounds on healthy trees with tree paint (or latex paint) can guard against insect vectors that might otherwise initiate new infections (O'Brien et al. [ND]). Establish trenches at least 1.2 m deep to prevent the spread of the disease through root grafts. The installation of a water permeable membrane in the trench may help to prevent breakouts. Trenches must be dug 31 m beyond symptomatic trees. Trenches are effective 75% of the time and cases of failure occur within 2 to 3 years after trench establishment (Wilson 2005). High-value oaks should be treated through preventive applications of a systemic fungicide either as a micro-injection or as a soil drench within the dripline. Registration of the fungicide must be arranged in advance through the PMRA. 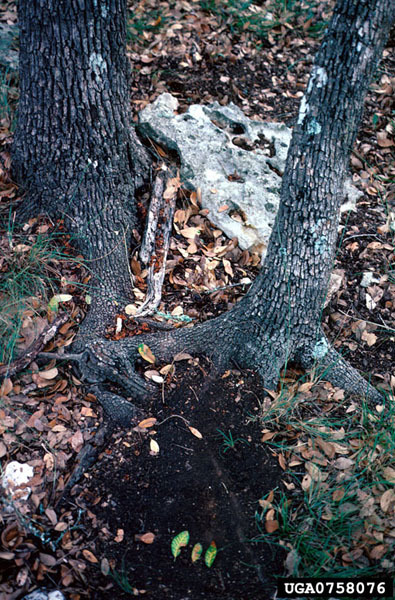 Conduct research, identify oaks with resistance and propagate them. Anonyme 2007. Ceratocystis fagacearum (Bretz) Hunt - Flétrissement du chêne. Agence Canadienne d’Inspection des Aliments (ACIA), http://www.inspection.gc.ca/francais/plaveg/pestrava/cerfag/tech/cerfagf.shtml Consulté le 11 mars 2009. Appel, D.N. and Kurdyla, T. 1992. Intravascular injection of propiconazole in live oak for oak wilt control. Plant Dis. 76: 1120-1124. O’Brien, G.J., Mielke, M.E., Starkey, D. and Juzwik, J. [SD]. 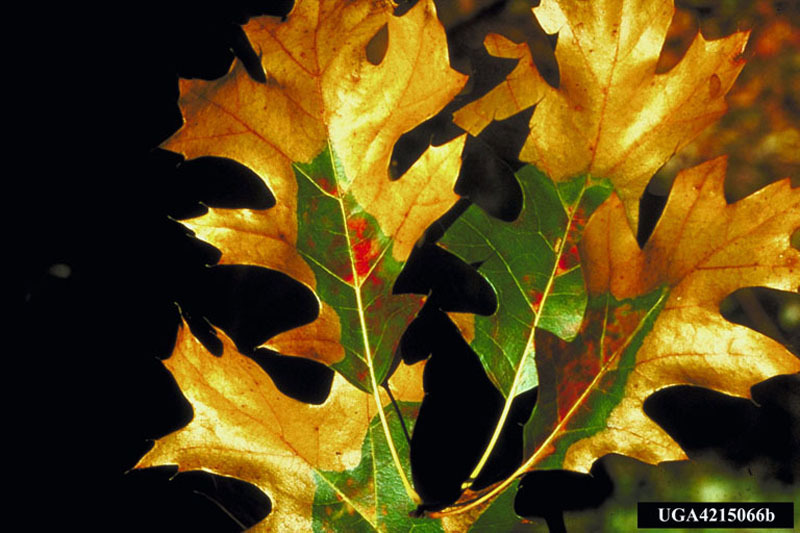 How to Identify, Prevent, and Control Oak Wilt. USDA Forest Service, Northeastern Area, State and Private Forestry leaflet NA-PR-03-00, http://www.na.fs.fed.us/spfo/pubs/howtos/ht_oakwilt/toc.htm accessed October 1st 2009. Wilson, A.D. and Lester, D.G. 1995. Application of Propiconazole and Pseudomonas Cichorii for Control of Oak Wilt in Texas Live Oaks. Fungacide and Nematicide Tests 50: 393. Wilson, A.D. and Lester, D.G. 1996. Evaluation of Propiconazole Application Methods for Control of Oak Wilt in Texas Live Oaks 1995. . Fungacide and Nematicide Tests 51: 389. Wilson, Dan A. 2005. 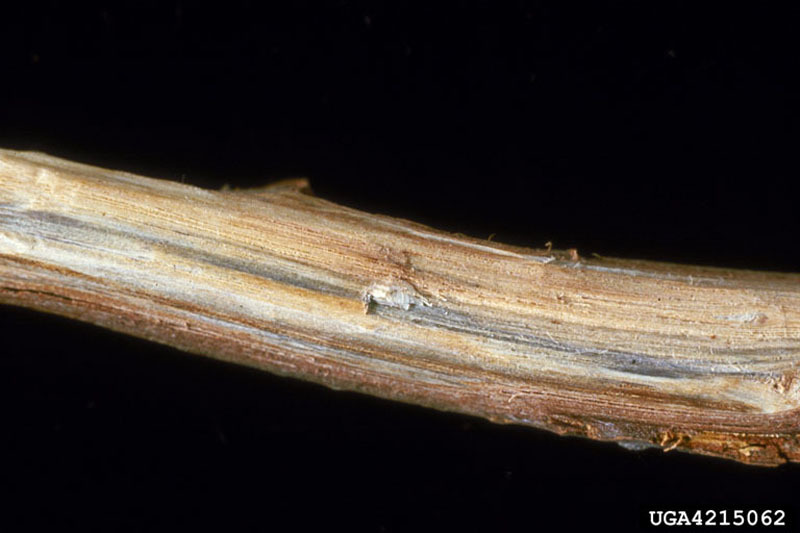 Recent advances in the Control of Oak Wilt in the United States. Plant Pathology Journal 4: 177-191.